Problem solver from KERN-DEUDIAM for the work on hard tiles, hard pressed tiles, granite and similar products. 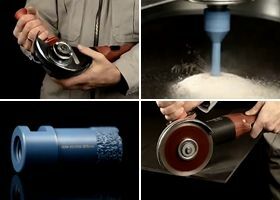 Quick, cleanly and at a reasonable price with the diamond saw blades CC-F and TEC-F by KERN-DEUDIAM, as well as the special tile drills KBF-PREMIUM and the hand grinding pads for the edge treatment. 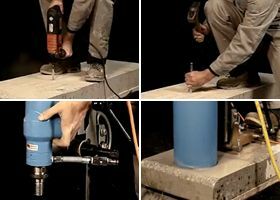 Wet drilling of concrete with the KBN premium drill bits which are laser welded up to Ø 300 mm, so that no segment breaks off due to overheating. By the use of the new drill rigs KDS-XXL in the including guide rolls and fine feed, as well as the drilling motor WEKA DK 32 drilling up to Ø 350 mm can be easily carried out. 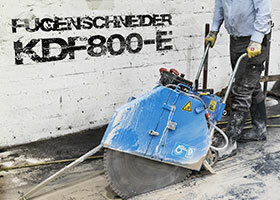 With the powerful 11-kW floorsaw KDF800-E you can make time and tool saving cuts up to 320 mm depth in reinforced cured concrete by proper usage for example for machine foundations. By use of the correct diamond saw blade, i.e. Laser X500 Made by KERN-DEUDIAM, you can do the cutting work with low cost. Product training in live video, also on YouTube.